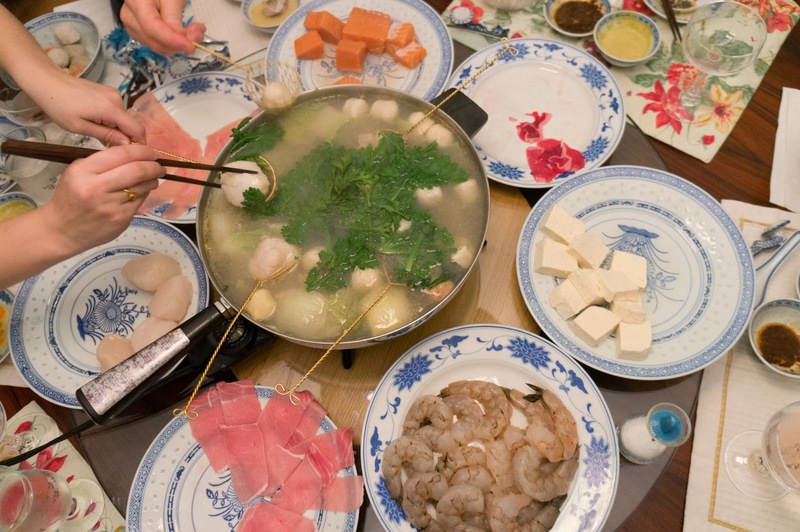 Chinese fondue (also known as hot pot) is my family’s New Year’s Eve dish; everyone helps out. We usually go to the grocery store together and everyone is given various tasks to help prepare the meal. My mother prepares the sauces and a simple stock. Kelly and my mother arrange all the ingredients and set the table; this year David did too. My dad pours champagne and slices all the meat. I help with random tasks, such as making dessert. The food is cooked in the boiling soup pot at the table as we are eating together. My mother’s focus for this meal is using the freshest ingredients possible. This year, the scallops and shrimp were especially good; the scallops were expensive but she says that she doesn’t mind paying for them as long as they are indeed fresh and tasty. She also buys good quality steak, pork, and chicken breast. We freeze it until it is rock solid, and then my dad uses a meat slicing machine to make slices which are very thin so that they cook quickly. 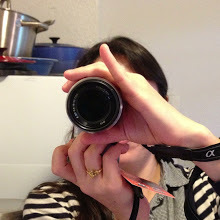 The old machine finally stopped working last year, so we got a new one this year, which is shown in the picture below. My parents prefer this over buying pre-sliced meat, since they can choose a higher quality cut. They prefer leaner meats, which my mother proudly points out that at the end of the night, the broth has hardly any rendered fat floating on top of it. We always have fish balls because that’s my sister’s favorite. Ingredients that can be cooked for a long time such as napa cabbage, fish balls, mushrooms, and tofu are placed in the pot and can be taken by anyone. Ingredients that cook quickly or can be overcooked are cooked by each person in a personal basket so that they are easy to keep track of can can be cooked to the individual’s preference. To make this dish, you do need some specialized equipment. Some sort of electrically powered or portable pot heater is essential, because you need to keep the soup stock hot in order to cook ingredients at the table. In my house, the hot pot is actually an electrically powered frying pan that is set to an appropriate temperature to keep the soup hot; my parents have owned this pot for years. The small handheld wire baskets (presumably available at an Asian cooking supply store) are useful for cook ingredients in and to fish out ingredients floating in the broth, though aren’t strictly necessary. Chopsticks are useful; I prefer having one pairs of chopstick for eating, and one for touching raw ingredients and the shared broth, though the rest of my family just uses one. 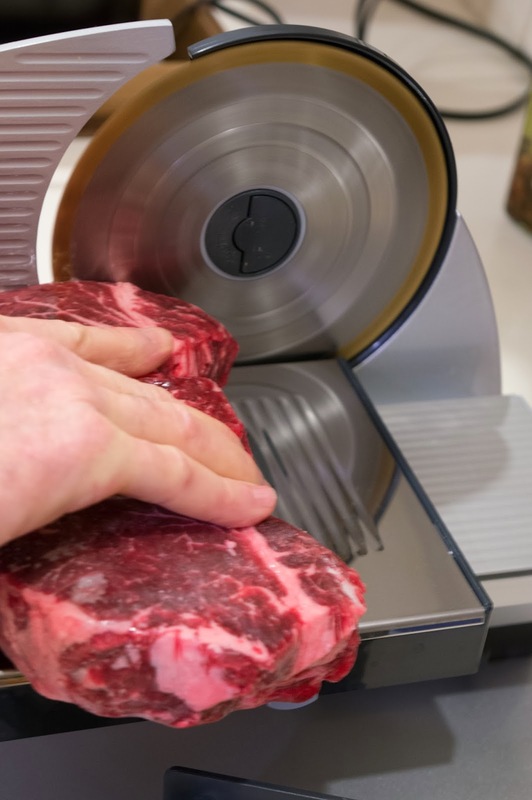 A meat slicing machine is optional since you can buy pre-sliced meat at Chinese grocery stores. The stock is just water boiled with some scallions, ginger, salt, and black mushrooms that have been soaked in cold water until soft; often my mother also adds some extremely diluted broth to give more flavor. The pot is filled with the stock and raw ingredients are placed all around on platters. This dish is usually eaten in winter because a lot of water evaporates and makes the room warm, cosy, and steams up the windows of the dining room. Extra stock or hot water should be kept at a low simmer on the stove, so that the hot pot can be replenished when it gets low. We also always add sliced napa cabbage into the pot during cooking; this flavors the broth more, and it is nice to pluck out vegetable pieces to eat as you are waiting for something to cook. After being cooked in the simmering water, each ingredient can be seasoned by the diner just before eating it with some provided sauces. The two sauces (a coconut curry sauce and a salty brown sauce) that my family always uses are described below. The amount of food here was nearly the perfect amount for six people. We finished off nearly everything except for a few slices of pork–where “we”, as my mother comments, are six people and four little dogs. Yes, she really does cook some extra meat (usually the pork and chicken which people tend to eat less of), cut it up, and feed it to the dogs. We soak some clear noodles in cold water during the meal, so that at the end of the meal a soup and noodle dish can be eaten, flavored from the ingredients that everyone has been cooking and a small dash of the leftover sauces. Nearly everyone is too full to have much of the soup or clear noodles at the end of the meal, though it is my favorite so I had two bowlfuls on this night. Salty Brown Sauce: Put a few Tbsp of the solid part of Chinese BBQ Sauce (Bull head brand by Haw-Di-I Foods) into a medium-hot saute pan (try to get as little oil as possible). Heat until fragrant (this should take only a minute or two). Turn off heat, and add enough soy sauce to make a slightly drippy mixture (use much less soy sauce then BBQ sauce, maybe only a Tbsp or two, depending on how much BBQ sauce you used). You do not want to burn the soy sauce, so don’t cook the sauce much after the soy sauce has been added. The sauce should taste salty and slightly strong, since it will dilute slightly when ingredients are dipped into it. Curry Coconut Sauce: Shake one can of coconut milk, and remove the top. Place several Tbsp of curry powder in a medium-hot small saute pan (optionally you can add a small amount of oil with the curry powder). Heat until fragrant (30 seconds or so). Pour the coconut milk into the pan. Bring the sauce to a low boil. Optionally mix a few tsp of corn starch in a little bit of cold water, and add a few spoonfuls to the hot sauce to thicken it. Let the mixture boil for a minute and check the texture; keep adding the diluted corn starch and boiling until the sauce has thickened. The sauce should be a little thicker then curry usually is, since soup water from the cooked ingredients will dilute the sauce. The sauce should have a smooth texture; you do not want the coconut oil to separate from the coconut milk the way you would for a Thai curry so you should only cook the curry sauce briefly. Add salt or soy sauce to taste (usually we use soy sauce). Plus 4 dogs – they all had a share of the meat.